Today was one of those days in which a student points out something so obvious, that I’m shocked that I’ve never considered it before. I think sometimes my eye is so trained to look for certain visual details, that I need a new pair of eyes to help me look at familiar paintings in a more objective way. 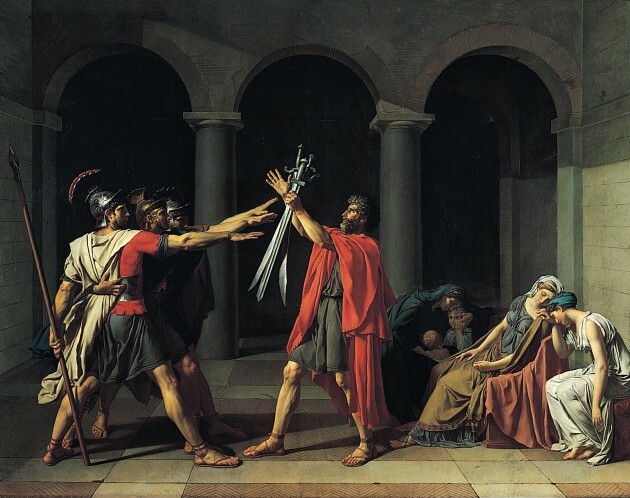 That was the case today: when discussing the Oath of the Horatii in class, a student raised her hand and simply asked why the brothers have their hands raised in a gesture that looks like the Nazi salute. And now after looking at the painting, I’m embarrassed as to why I never really entertained that thought before. It’s interesting to me that David’s painting would have these changing political meanings over the centuries, long after David had died. In some ways, this change in political associations is in line with David’s own career: he often would cater to whatever political group or leader was in power. As a result, David was associated with French Revolutionaries (including Robespierre during the Reign of Terror) earlier in his career, and then about a decade later, became the First Painter to Napoleon. In an unexpected way, the fluctuating political associations with the “Oath of the Horatii” gesture, especially in modern times, appropriately parallel the flexible political persona that David crafted for himself during his lifetime. 1 Albert Boime, Art in the Age of Revolution: 1750–1800 (Chicago and London: University of Chicago Press, 1987), 400-401. 2 Martin M. Winkler, The Roman Salute: Cinema, History, Ideology (Columbus: Ohio State University Press, 2009), 54.